Sawasdee krup! Laew khun la krup! Yes, we're in Bangkok. It's steaming hot, there is street food everywhere and of course we are loving it. 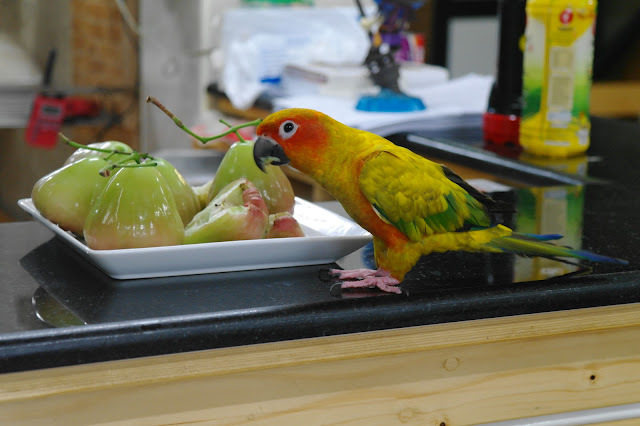 There's so much going on food wise that my posts over thse. e next two weeks will be more focussed on photos rather than descriptions. Even as I write that I'm not fully convinced myself that I will be able to keep my ramblings concise. On our first morning we decided to jump on the ferry to Wang Lang market. We are staying on Phra Artit not far from Khao San road and the ferry leaves from our doorstep which is incredibly convenient. 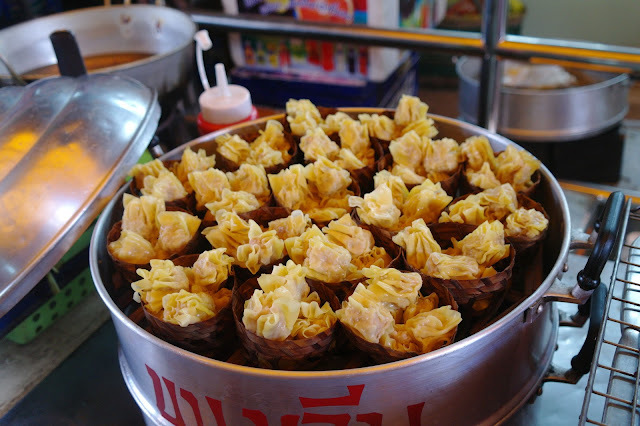 So many great looking snacks available at Wang Lang, here is a sample. Miang Kham is a perennial favourite. I had to buy a bag for later. It goes so well with cold beer! Polly want a rose apple? Kanom Jeeb are obviously Chinese influenced. The comparison to Sui Mai is obvious. There were particularly tasty and came with a lovely sauce. 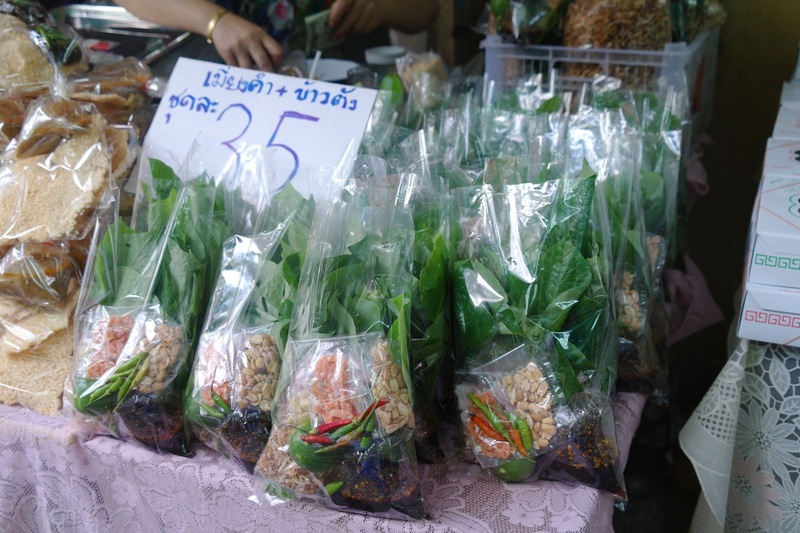 20 baht for a small bag, what a bargain. 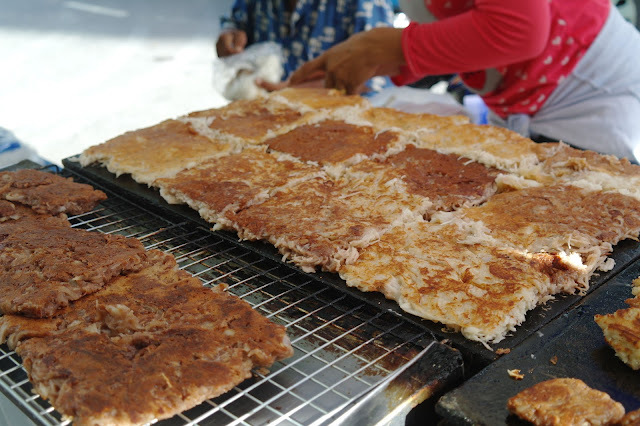 These are Blaeng Jii Khao Niaw otherwise known as coconut sticky rice pikelets. 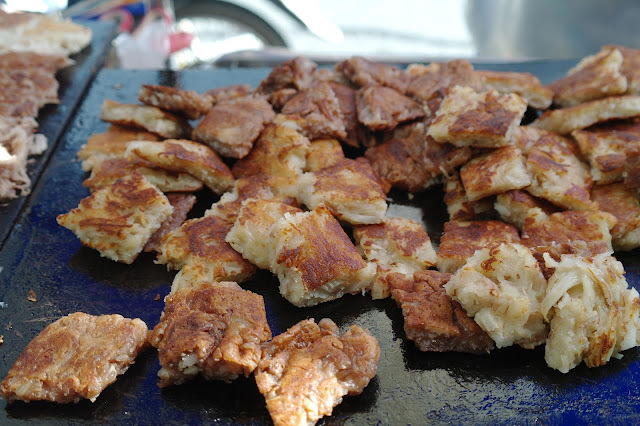 Typically these are cooked in little mini pikelet size cakes but this clever vendor was making them in slabs then slicing them up into bite size pieces. Wang Lang had so much more food on offer but we are just finding our feet and getting into the swing of negotiating a stroller with 3 year old around these crowded markets laneways whilst dodging the scooters and other obstacles so that's all the photos we managed to get from Wang Lang market.